Over the past few years, appliance brands large and small have begun to stake their claim in the kitchen market. One that's been especially active is Electrolux; in 2015 the company launched a smart steam oven with a connected camera, and they acquired sous vide company Anova in February of 2017. In preparation for SKS Europe this June in Dublin, we spoke with David Cronström, their Head of Strategy and Ecosystems, about the future of smart kitchens, what connectivity means to him, and his favorite pasta dish (hint: it has truffles). Q: You’re Head of Strategy and Ecosystems at Electrolux. What exactly does that role entail? A: We have an organization within Electrolux that looks after connectivity. My team looks after the overall IoT strategy for Electrolux, as well as our global partnerships, like if we do something with Google or Amazon or Apple. As we connect things there are new business models that our team also looks into, we do a lot of business model innovation work. We talk about taste when we talk about the kitchen; it’s all about getting the best taste from cooking with your appliances. That also encompasses services and apps and accessories and things like that. We are working hard to create great consumer experiences. Digital technologies and connected appliances gives us new tools to do this. Q: Sometimes smart kitchen can refer to connected appliances, but also to products that are very well-designed. What does “smart” mean to you? A: At Electrolux, if we call an appliance smart we mean it’s connected. There are at a lot of digital touchpoints throughout the consumer journey. From when you’re looking for inspiration to the post-purchase part where you’re actually using the product, adding functionality to it. Digital is such a big part of that journey, and we don’t ignore it. However, the “connected” category can apply to a lot of things. It includes services, apps, voices and actions. Just thinking about it in terms of wifi is a bit narrow. Q: Electrolux has an entire section devoted to smart kitchen appliances on their website. How have you seen the demand for smart kitchens items — and smart home items in general — grow during your time at Electrolux? A: There’s no doubt that the market is growing. Smart and connected products are a very fast-growing segment and we see growth across the board. Some of the kitchen products I’ve seen increasing in popularity are things like precision cookers,. However, I do think that it’s still a very emerging market. A lot of companies are experimenting with products for the smart kitchen, trying to figure out how to use connectivity in a way that actually solves a problem. That’s very core to our mission; we want our products to address an issue, not just be connected in order to tick a box. Q: How do you envision Electrolux expanding their smart kitchen offerings in the future? A: First of all, we recently introduced a smart oven. 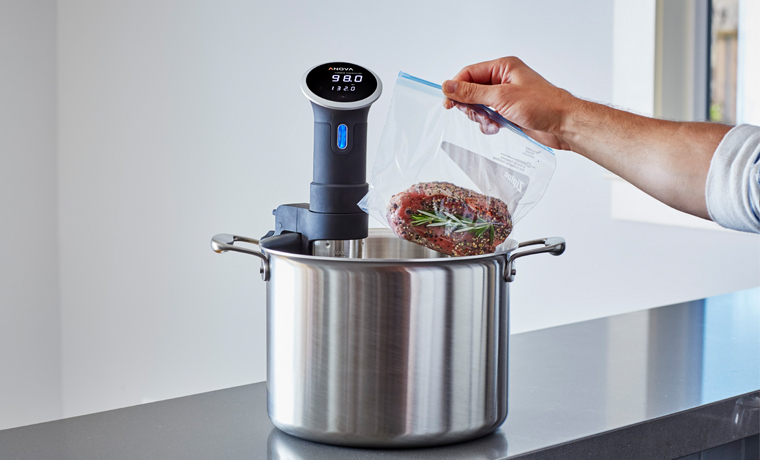 It has connectivity and an integrated camera, so consumers can look into the oven, check on what they’re cooking with an app and remotely control the cooking process by changing the time duration or temperature.. Combining appliances with other assets, like apps, content or a digital voice assistants, inspires people to cook. It helps them get the perfect result. For some consumers, it gives them the confidence to try new meals. Many people, myself included, tend to resort to cooking the same 10 dishes all the time. We don’t have the confidence or time to experiment. That will change as we assist consumers in the kitchen. With our connected appliances, you can have confidence that dishes will turn out the way you want them to. The products we’re selling have such functionalities, like the smart oven. Thank’s to the connected app so you don’t have to worry about anything: it includes recipes, step by step guidance, and tips on how to cook. You can search by certain meal types and find whatever you’re in the mood to cook. Once you choose a recipe, it’s broken down into steps. It tells you things like when you need to preheat the oven, and you can send instructions directly to the oven. The oven becomes your sous chef, it takes care of things for you. Sometimes when people are cooking they feel stuck in the kitchen. They don’t dare leave it since those last 10 minutes of the cooking process are a critical part. With the connected camera, however, you can still keep an eye on things even if you’re not in the kitchen. You can extend cook time or change the temperature from your sofa. This addresses a need we found by studying consumer behavior. Q: What’s a big problem in home or restaurant cooking that technology hasn’t fixed yet, but should be? A: There are a lot of areas where there are solutions, but they can be improved upon. Maybe there’s a better way to go about saving time or getting the best result or finding inspiration. It really depends on the consumer; everyone values different things while cooking. One thing I hope to see is more products that can work together, regardless of brand. That’s a hurdle that has been there for a while. People don’t want to be locked in to purchasing everything in their home from one brand. That’s one reason why we’re working, for example, with the Open Connectivity Foundation, to define a protocol that will help products to work together and speak the same language. Q: What’s next for Electrolux? How do you see them growing over the next 5, 10, and 20 years? A: The kitchen is such a central part of any home, it’s the heart. For that reason I think you are seeing, and will see, more companies and brands moving into the kitchen, and more and more products getting connected. There will be a lot of new services popping up that relate to the kitchen, whether that’s replenishment, shopping, or even entertainment. I see an ecosystem formed around the kitchen. Q: What’s your absolute favorite thing to cook in the kitchen? A: I think it would probably be pasta. At home we do a pasta with truffles and beef or mushrooms on top, which is one of our favorite dishes. If you want to hear Cronström speak more about creating sustainable innovation, get your tickets to see him at SKS Europe in Dublin on June 11-12th!